I’ve been seriously trying to eat healthy lately. But it’s kind of hard when you live with a guy who actually strives to eat at least 4,000 calories a day and likes to have slices of pizza as snacks between meals. So usually when I cook at home during the week days I try to balance out all the mass amounts of cheese and carbs that I shove into my face on the weekends. When I lived by myself I would cook healthy veggies and soups and casseroles and live off them for weeks at a time, but that won’t fly with Matt. Matt literally eats like a a million helpings of whatever I make, and if it’s something light like soup or salad he’ll be foraging for food 30 minutes later. My point is, I’ve been trying to cook flavorful and delicious meals that he’ll love (and that I’ll love) AND keep them as healthy as possible. Sometimes a carb or two slips in but I feel like for the most part my meals are pretty nutritious and totes yummy. A prime example is this ah-maaaz-ing salmon recipe. It’s so easy! And also there’s not a single drop of oil or butter in the recipe! 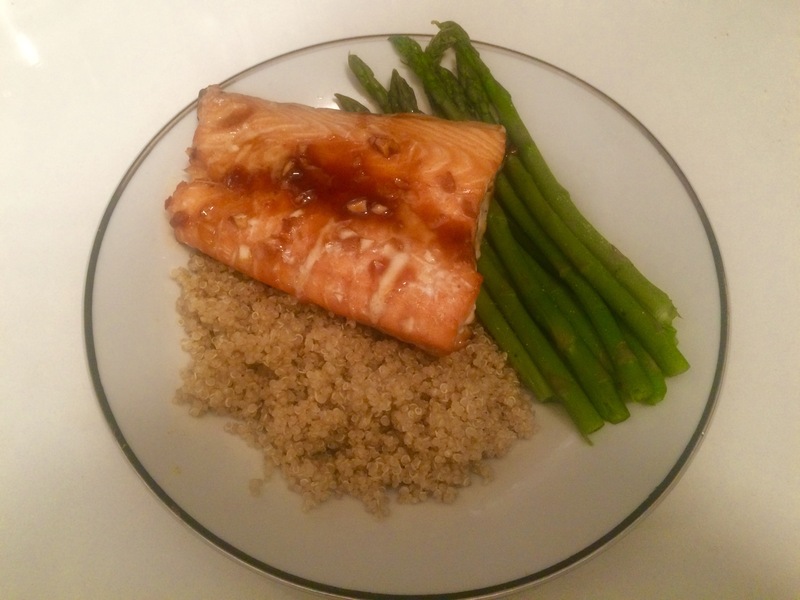 The flavors are so intense in this Asian Salmon; you get salty from the soy sauce and sweet from the honey and ginger, and a little kick from the sriracha. Matt actually begs for this recipe, but it’s so simple I feel like I’m cheating!! It’s a pretty basic recipe, and it tastes just like a more flavorful teriyaki sauce (teriyaki sauce is basically just soy sauce, ginger, sugar, and a teensy bit of sake sometimes). You can find a lot of variations of this sauce on sites like pinterest, and that’s the beauty of it!! You can basically add whatever you want and it will taste great, and your measurements don’t have to be perfect. If you like sweeter sauce use more honey, and if you like saltier use more soy sauce. Go heavy on the garlic or ginger depending on your taste. BUT MAKE SURE you make extra sauce and smother whatever sides you prefer with it. IT LITERALLY TASTES GOOD ON ANYTHING. For the sauce, combine the honey, soy sauce, ginger, garlic, sriracha, and chives if you prefer, and mix together until honey is dispersed throughout. Put the salmon in a ziplock freezer bag and pour half the sauce in, making sure the sauce is coating the salmon all over. Let the salmon marinate in the fridge for about 15 minutes to a couple hours, while your oven is preheating at 400 degrees. When the oven is ready and the salmon has marinated, put the salmon on an aluminum foil lined baking sheet and put in the oven for 15 to 20 minutes. Save the sauce that was in the freezer bag! Put it back with the other half and simmer it in a small sauce pan for 5 to 10 minutes. Test for the salmon to be done by sticking a fork gently in the thickest part and seeing if it flakes easily. Do not overcook! Nothing’s worse than overcooked salmon. Serve with steamed veggies and either rice or quinoa to soak up all the yummy asian goodness! I’ve found that broccoli or asparagus are wonderful additions! Tip: Don’t be afraid! Salmon is totally fine to eat medium-well, medium, or even rare. Heck, I eat it raw all the time! So if you’re unsure if it’s done or not, as long as it’s flaking easily it’s probably just fine. It’s better to undercook it than overcook it! You can always pop it back in if you prefer it cooked more.